Friday, March 9th @ 7:00PM – Only $26.95 per seat! SouthBound and Company is pleased to present: A Tribute To Lynyrd Skynyrd And Frynds In this high-energy, Southern Rock Review, SouthBound and Company combine the southern vocal stylings of Ronnie Van Zant with the dual guitar-slinging replications of Southern Rock mega-hits such as ‘Sweet Home Alabama’, ‘Ramblin’ Man’ and of course, the immortal ‘Free Bird’. 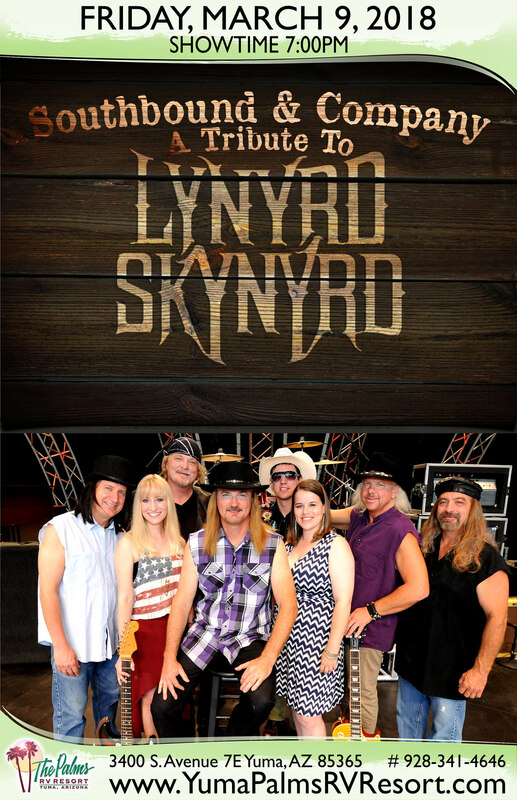 Featuring eight seasoned professionals coming together to fulfill their life-long passion, SouthBound and Company: A Tribute To Lynyrd Skynyrd and Frynds not only duplicate the sounds of Ronnie and the Boys, they also present a visual demonstration of a real-life Southern Rock show from the ’70’s. The combination of a tight back-beat rhythm section, honky-tonk piano, dualing lead and slide guitars and deep south, rhythm and blues lead vocals prove that old adage: The South Will Rise Again!